By "we" I mean of course, Yahoo! I got pinged via IM today from Justin Everett-Church, who works here at Yahoo and wanted to introduce himself since I had posted a picture of his Flash app on my post about Nokia licensing Flash Lite 1.1. ("I did?!" I thought) You can check it out here, it was the winning entry to Macromedia's Flash Lite 1.1 contest. 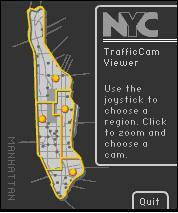 It's a dynamic map which pulls up live pictures of New York traffic cameras. It's very, very cool. Justin's a Flash pro here at Yahoo, but did this app on his own time. To compare with J2ME development I asked him how long it took him to develop and he said about 20-30 hours, which is pretty damn cool. (Most of that was tweaking the 40 or so different camera images). He said developing the app was "nostalgic" because it's based on Flash 4. That's definitely a polite way of putting it, I've seen on some of the mailing lists that there are many Flash developers who can't stand the idea of going back, but obviously there's a lot to gain from the effort. I mean, that app is *cool* and doing the same sort of thing in Java would be *a lot* of work. Now, in deference to my friends at Adobe, I have to say I'm still waiting for the SVG equivalent to this sort of app. I know SVG-T is on all the new Vodafone phones, but I have yet to play with an app in person. When are we going to see an SVG plug-in for Series 60? Someone tell the guys at BitFlash to start selling their SVG player to the public, damnit. Amusing side note: after our first chat via IM, Justin pings me again and says, "You must be close by, I just saw your phone in my Bluetooth list." It turns out we sit less than 10 feet apart. Gotta love cubeland.